Everyone’s really buzzing that we’re top of the league. When you’re on a winning run, you can’t wait for the next game. And that’s the way we’re all feeling at the moment. I’m really enjoying my time here at Wigan. The manager wants to play good football, which is the way I like it. It’s just a really good team to be involved with at the moment - a winning side - which is always nice. Even when we went 1-0 down at Shrewsbury last week, you could sense that we were nowhere near second gear. As soon as we started to go through the gears, and the first goal came, we knew it was only a matter of time before it was two, three, four, or five. I was lucky enough to get another goal, the equaliser, and it was nice to see it go in. To be fair it took me a couple of early shots to find my range. But when it sat up I only had one thing on my mind. I just wanted to get a good connection, and luckily it flew in to the net. People have asked me if they think it was as good as the one I scored at Walsall, and I don’t know. They were two good strikes...I’m not sure which one I prefer to be honest. Having said that, the one against Rochdale on Easter Monday was arguably more important in terms of what it meant for the team. Sometimes you just have to take those to grind out a 1-0 win, and those three points could be massive at the end of the season. At this moment, you’ll just take anything as long as it means three points. Whether it’s a volley from 20 yards or a tap-in from a yard, you’ll take anything. I’m just enjoying my football at the moment - and long my it continue. We’ve got six games left - six cup finals - starting this weekend against Coventry. It’s just a case now of just doing whatever you have to do to get over the line. You do it game by game, and just try and chalk them off one by one. We’re on a good run at the moment, there’s a lot of momentum about the place. We’ve only got one midweek game to come - at Burton - so we’ve got plenty of time to recover from each game. When you’re on a roll, you don’t feel tired. We just want to play football and keep winning. I have to say I’m really enjoying my loan period here at Wigan. I’m sure the staff back at Everton will have been watching how I’ve been doing, checking up on me. But at the moment I’m not really thinking about Everton. 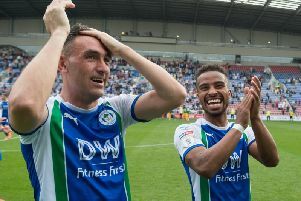 My head’s just fully focused on doing well for Wigan, and taking it game by game. As to what happens at the end of the season, I don’t know to be honest. I’ve still got another year at Everton after this, and it’s totally out of my hands. I’m just looking at this as the next chapter in my career. I’m thinking too much about. There’s far too much going on to be worrying about anything else.